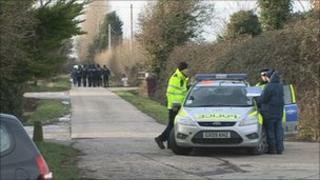 A man has been arrested on suspicion of murder after a man's body was found at a plant nursery near Chichester. Sussex Police said the body was found at the nursery, off Almodington Lane in Batchmere, early on Sunday. A police spokesman said a 53-year-old man was arrested in connection with the death and is being held in custody. Police said the Romanian victim, thought to be 45, had several stab wounds. Searches of the nursery and the surrounding rural area are under way. A statement issued by police said: "It is believed that the man had been staying at the site and died shortly before the alarm was raised, but we are not prepared to be more specific at this time." Officers said the clothed body of the man was found on the ground at the nursery in Second Avenue at about 0020 GMT. A post-mortem examination is still to take place and the man has not yet been formally identified. Anyone who was in the Bracklesham Bay and Birdham areas near Selsey late on Christmas Day and who saw anything suspicious has been asked to contact the force.